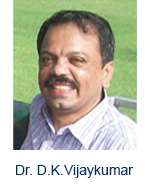 Dr. D. K. Vijay kumar is a Professor in the Surgical Oncology Department of Amrita Institute of Medical Sciences and Research Centre at the University of Amrita Vishwa Vidyapeedham. He received his M.S Degree in General Surgery from Pune University in 1986, and earned his postdoctoral M.Ch in Surgical Oncology from Dr. MGR Medical University of Chennai. He then worked as a Assistant Professor in Surgical Oncology at Manipal Institute/University for 6 Years. He is having 24 Years of Experience in the field of Surgical Oncology. His Area of Expertise includes breast and gynecologic oncology.He is the author of many articles in national and international journals. HOD of Medical Oncology & Clinical Hematology, FORTIS Hospitals, E.M Byepass and AMRI Hospitals, Dhakuria, Kolkata, India. Dr. B.R. Ambedkar Institute-Rotary Cancer Hospital, AIIMS, Department of Medical Oncology. Head, Department of Radiation Oncology, Convener, Faculty Development Program, Convener, Faculty Development Program, Chairman, Examination Cell, Faculty In-charge, Research Cell, AIIMS Bhubanshwar, India. Professor and Head, Department of Molecular Biology, Cancer Institute (WIA) Adyar Chennai, India.